This is just a quick message to wish a Happy Christmas to all you lovely followers of my blog. I have been hard at work over the last couple of months writing the fourth novel in my LAVENDER ROAD series. I feel as though I have been living in 1942 so it comes as quite a surprise to find myself about to celebrate Christmas 2013! And what a difference. In London in 1942 there were no whole, fresh turkeys or chickens to be had for love or money (or food ration book tokens!) And of course there were no frozen ones either in those days. The best most people could manage for their festive lunch was a chicken and dumpling pie. Sugar, suet and dried fruit was in short supply too so Christmas puddings were either very small or non existent. The toy shops were pretty much bare of everything except cardboard models and most fathers found themselves making toys and/or dolls from salvaged bits and pieces for their kids. One old lady I spoke to told me of a treasured necklace she had been given by her fiancé made from cherry stones! Crackers and paper hats were often made out of newspaper. And if you fancied a festive tipple, the likelihood was that your local pub would have asked you to bring your own glass! It was easier to buy Wellington boots than shoes and, because of the difficulty in finding them, women no longer had to wear hats in church. At Christmas 2013, millions will have been been spent in the UK on pet food alone. In 1942 it was illegal to put breadcrumbs out for the birds. So there you go – enjoy the festivities, and remember to relish your freedom and your food and your gifts – and don’t forget to raise a glass to all the stalwart souls (like my characters in LAVENDER ROAD) of 1939 – 1945 who made it all possible! Wow – what a difference! We home school, and today my son and I are talking about Perspective. This will be the very next thing I read to him. He’s writing about another story he just read. This will be fun to share with him. Thanks! Glad you found it interesting, hope your son does too! All best wishes. Yes, in fact one of the characters in Lavender Road keeps chickens – her experiences (or rather her inexperience) gave me an opportunity for a bit of humour too! Happy New Year! Thank you for your Christmas greeting and for insight into what it must have been like to celebrate Christmas in 1942. 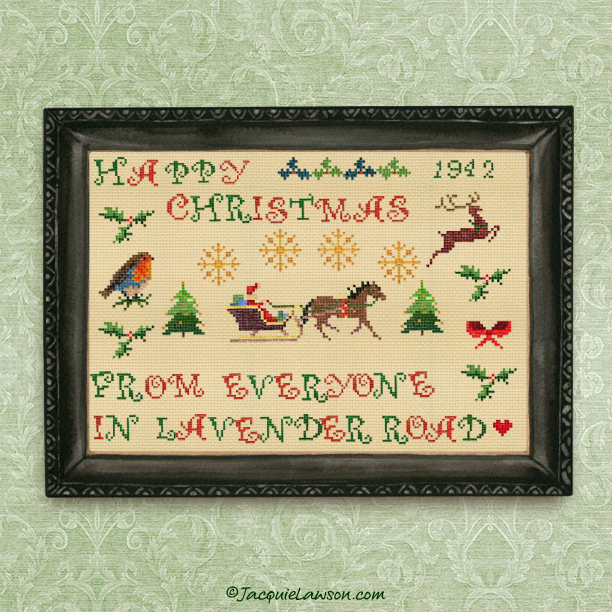 I wish you a very happy Christmas and look forward to reading your new Lavender Road book soon.